Nagoya, May 16, 2017 --- Okuma Corporation (TSE:6103, Okuma) and Hitachi, Ltd. (TSE:6501, Hitachi) today announced that they have embarked on collaborative creation aiming to establish an advanced high-efficiency production model that supports mass customization making use of IoT1 and set up an experimental model at Dream Site2 (DS2), Okuma's new plant. The two companies, both specialized in manufacturing, will work on the overall renovation of the next-generation manufacturing processes, ranging from processing to assembly and services, as well as on the creation of the model. The target of this demonstration experiment is to increase productivity by twice and to reduce production lead time by 50%2 at DS2. Given recent trends in the manufacturing industry, such as the rapid development of diversification in customers' needs and digital technology as well as intensified global competition, manufacturers are required to achieve mass customization that delivers productivity equivalent to that of mass production, even in ultra-high-mix low-volume manufacturing, which caters to the needs of individual customers. With this background, production planning often needs to be changed due to order interruptions for the quick delivery of a product or an unexpected change in the deadline or specifications, creating issues of interrupt production reduce. Machine tools, among other products, are standard in the case of ultra-high-mix low-volume manufacturing. Not only are the customers' needs diversified, but also machine tools are manufactured by processing and assembling several thousand to several tens of thousands of components. Thus, it is important to construct an ultimately high-efficiency production model capable of manufacturing “just what is needed, only when needed, only in the quantity needed,” even in one-by-one production*3 or when an unexpected change to an order is received. To take on this challenge, Okuma established Dream Site1 (DS1) in 2013 and has played a leading role in implementing high-efficiency and smart factories since then. The company has studied the possibility of constructing an even more advanced next-generation factory by making use of its know-how and accumulated experience. Hitachi develops and provides solution cores for manufacturers by making use of its many years of experience and know-how as manufacturer as well as its exceptional research and development capabilities gained through the development of the IoT platform “Lumada,” utilizing IT with OT*4 . 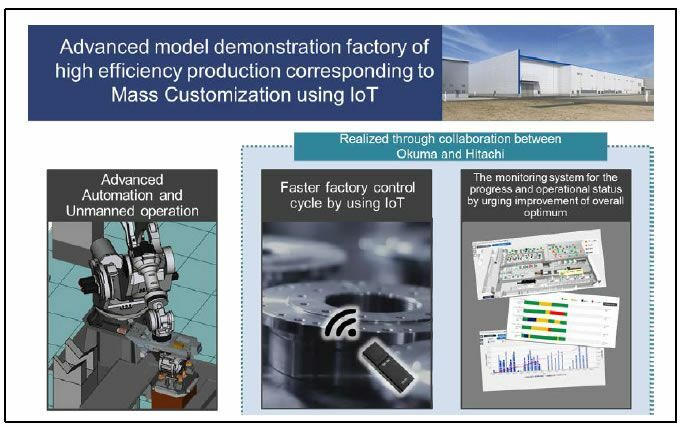 Under the themes “evolution of production visualization” and “faster factory control cycle,” Okuma and Hitachi created an experimental model for high-efficiency production supporting mass customization in the new plant, DS2, by integrating the know-how of the two companies. By using IoT, the new system carries out advanced analysis by combining the data on the production progress conditions and the facilities' operational status, monitoring/visualizing both data in an integrated manner with the monitored/visualized data. This system allows the process to be accelerated, from the detection of bottlenecks in the process (delays in prior processes or failures in the facility, etc.) to the implementation of countermeasures for total optimization. Using big data collected from the field and accumulated by the monitoring system regarding the progress and operational status and employment of the advanced automatic learning simulation AI5 technology, the next step is to develop this into a system that automatically and dynamically generates a high-precision production schedule according to the ever-changing situations in the field, which had been difficult to develop in the past, aiming for fast and flexible optimization for production planning. 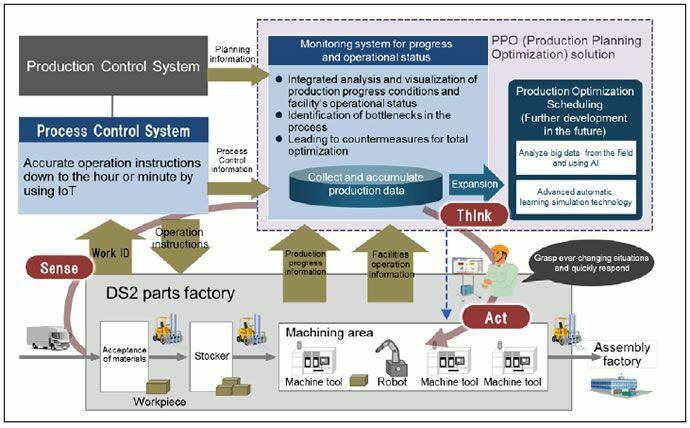 These systems are provided as a function of the Production Planning Optimization (“PPO”) solution, a solution core for industries using Hitachi's Lumada. The system infrastructure is provided by Hitachi's Demae Cloud6 . The work ID (recognition tag)-based process control system is introduced to obtain an accurate understanding of the whereabouts of processed component within a plant and its status and to quickly and accurately provide operation instructions down to the hour or minute using IoT, such as in the transportation of a component. Moreover, coordination with the monitoring system on the progress and operational status enables improved accuracy for the understanding of production progress and allows accurate detection of a bottleneck and quick implementation of a countermeasure. Moreover, Okuma and Hitachi will review the collaboration model for developing the service business of the two companies as business partners. 1IoT: Internet of Things2Comparison of DS2 and conventional production system.3One-by-one production: One component or machine is processed or assembled at a time, following the process order, and is then transferred to the next step4OT: Operational Technology. Control and operation technology5AI: Artificial Intelligence6Demae Cloud: Hitachi's cloud service for lending servers, middleware and operation maintenance as a package. Okuma Corporation (TSE: 6103), headquartered in Aichi, Japan, is a comprehensive machine tool manufacturer. The company's consolidated revenues for fiscal 2016 (ended March 31, 2017) totaled 162.7 billion yen ($1.5 billion). Okuma globally provides a broad range of machine tools, including lathes, machining centers, multitasking machines, grinders, and after-sales services. Okuma had approximately 3,400 employees as of March 31, 2017. Okuma develops not only machines but its own numerical controllers, motors, and sensors. Additionally, Okuma develops “Only-One” Intelligent Technology, a combination of machine, control, and information technology, that is highly regarded around the world. Okuma provides not only high function and high value added machines, but provides advanced solutions such as machining technology and automation technology, leading to production innovation. Okuma aims to become the world's best Monozukuri services company.